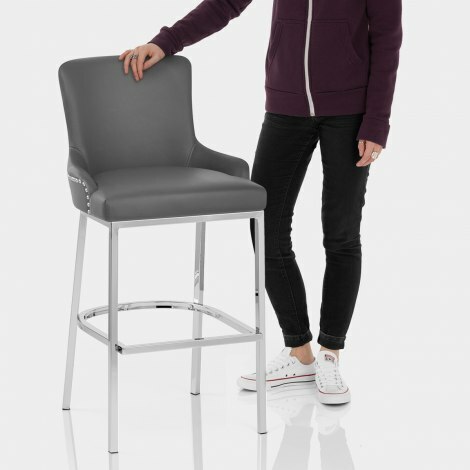 Bringing a blissful boutique look to the bar area, the Bliss Bar Stool Grey is the epitome of sophistication and modern style. Designed at the ideal height for the kitchen worktop, the Bliss Bar Stool is expertly crafted with comfort and class in mind. 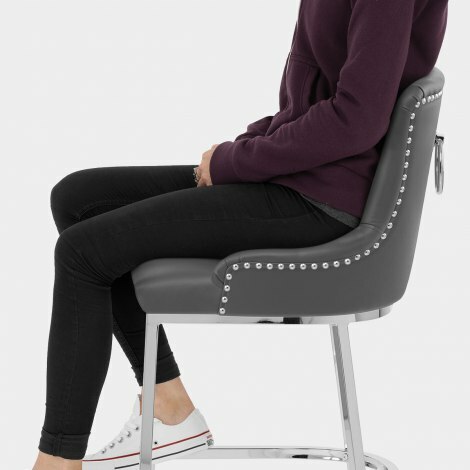 Glamorous grey faux leather upholsters the seat and tall back, which has a smooth padded design on the front, and features a splendid chrome ring with chrome stud edging on the rear. The fixed height frame is crafted from four mirrored chrome legs, which are set at kitchen counter height. These are strengthened by bracing bars and include a practical footrest. Protective floor plugs complete the design, allowing for use on a range of surfaces, making the Bliss a steadfast and stylish piece of furniture. "Fantastic quality and easy to put together"
We got 3 of these beautiful stool in white, grey & black. They are excellent quality and very comfortable. All experience from customer service to delivery was excellent. So happy to find a stool with shiny silver legs and leather look seat. all other companies seem to only stock fabric with wooden legs. Looks absolutely gorgeous in my new kitchen. Delivered so fast too. Thanks. Absolutely delighted with these bar stools. I have been looking for knocker back bar stools in leather material, parcularly grey ones for a very long time until I found these. Most shops just stock fabric ones. Great quality and appears to be the only retailer of grey leather knocker back bar stools. Just wish I could find grey leather knocker back dining room chairs to match. Great showroom with a huge choice of bar stools, great quality and prices. The Bliss bar stool is elegant and of a high quality and looks perfect with its chrome features, three together make a stunning statement when looking from my garden through the bifold doors, thank you for great choice & service Atlantic.